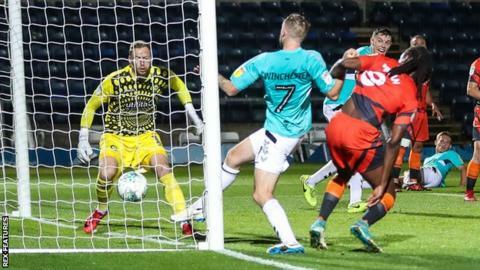 Wycombe Wanderers won a penalty shootout for the second Carabao Cup round running as they saw off Forest Green Rovers following a 2-2 draw. The Chairboys won 4-3 on spot-kicks as Ryan Allsop saved Paul Digby's effort. Scott Kashket put Wycombe ahead in normal time before Dayle Grubb levelled. Anthony Stewart latched on to Sam Saunders' effort off the post to restore Wycombe's lead, only for Carl Winchester to equalise again late on. In the shootout, Rovers striker Christian Doidge was denied by Allsop, while James Montgomery kept out Saunders' attempt. But Digby could not convert the chance to level at 4-4 and Wycombe advanced to the third round. Match ends, Wycombe Wanderers 2(4), Forest Green Rovers 2(3). Penalty Shootout ends, Wycombe Wanderers 2(4), Forest Green Rovers 2(3). Penalty saved! Paul Digby (Forest Green Rovers) fails to capitalise on this great opportunity, right footed shot saved in the bottom left corner. Penalty saved! Sam Saunders (Wycombe Wanderers) fails to capitalise on this great opportunity, right footed shot saved in the centre of the goal. Goal! Wycombe Wanderers 2(4), Forest Green Rovers 2(3). Reece Brown (Forest Green Rovers) converts the penalty with a right footed shot to the bottom left corner. Goal! Wycombe Wanderers 2(4), Forest Green Rovers 2(2). Anthony Stewart (Wycombe Wanderers) converts the penalty with a right footed shot to the bottom right corner. Goal! Wycombe Wanderers 2(3), Forest Green Rovers 2(2). Dayle Grubb (Forest Green Rovers) converts the penalty with a right footed shot to the bottom left corner. Goal! Wycombe Wanderers 2(3), Forest Green Rovers 2(1). Jason McCarthy (Wycombe Wanderers) converts the penalty with a right footed shot to the bottom left corner. Goal! Wycombe Wanderers 2(2), Forest Green Rovers 2(1). Gavin Gunning (Forest Green Rovers) converts the penalty with a left footed shot to the bottom right corner. Goal! Wycombe Wanderers 2(2), Forest Green Rovers 2. Nick Freeman (Wycombe Wanderers) converts the penalty with a right footed shot to the bottom left corner. Penalty saved! Christian Doidge (Forest Green Rovers) fails to capitalise on this great opportunity, right footed shot saved in the bottom left corner. Goal! Wycombe Wanderers 2(1), Forest Green Rovers 2. Joe Jacobson (Wycombe Wanderers) converts the penalty with a left footed shot to the top right corner. Penalty Shootout begins Wycombe Wanderers 2, Forest Green Rovers 2. Second Half ends, Wycombe Wanderers 2, Forest Green Rovers 2. Attempt saved. Paris Cowan-Hall (Wycombe Wanderers) left footed shot from the right side of the box is saved in the bottom left corner. Marcus Bean (Wycombe Wanderers) is shown the yellow card for a bad foul. Reece Brown (Forest Green Rovers) is shown the yellow card for a bad foul. Goal! Wycombe Wanderers 2, Forest Green Rovers 2. Carl Winchester (Forest Green Rovers) left footed shot from very close range to the bottom left corner. Assisted by Joseph Mills with a cross following a set piece situation. Attempt blocked. Dayle Grubb (Forest Green Rovers) left footed shot from the centre of the box is blocked. Isaac Pearce (Forest Green Rovers) wins a free kick in the defensive half. Substitution, Wycombe Wanderers. Alex Samuel replaces Adebayo Akinfenwa. Substitution, Forest Green Rovers. Isaac Pearce replaces Reuben Reid. Corner, Wycombe Wanderers. Conceded by James Montgomery.